Perimenopause signifies the time in a woman’s life when she experiences the first signs of menopause. The prefix peri- means “around” or “about,” so the word “perimenopause” indicates the time leading up to when a woman can no longer bear children. At this time period, the ovaries are significantly slowing production of hormones. Perimenopause is different for every woman, but it can last up to 10 years before a woman experiences menopause. The signs of perimenopause often mirror many of the symptoms related to menopause. Women may experience hot flashes, mood swings and even weight gain as a result of the body preparing to reduce its hormone production. According to Lady Care, there are often subtle symptoms that correlate with perimenopause like sleep problems, depression, irregular periods or even sore breasts. Another common sign of perimenopause is irregular or heavy menstrual cycles. These symptoms often last for a couple of years before eventually resulting in menopause and can vary in their severity. These symptoms can be incredibly uncomfortable and last for many years. Women as young as 30 years old can begin experiencing perimenopause symptoms. According to Our Bodies Our Selves, taking an over-the-counter NSAID, such as ibuprofen, can reduce symptoms of heavy bleeding and headaches. 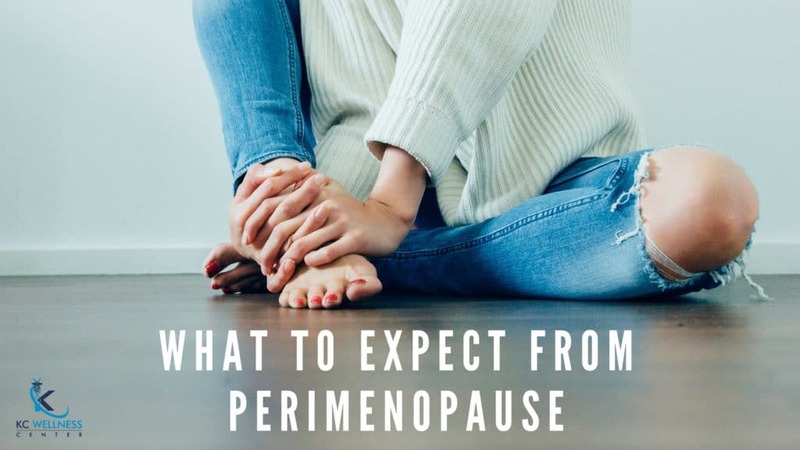 In order to find a permanent solution for the uncomfortable symptoms of perimenopause, women must correct the imbalance of hormones within their bodies. The best way to do this is through bioidentical hormone replacement therapy (BHRT). Since the hormones used in this procedure are exact replicas of the hormones that are produced in women’s bodies when they were younger, BHRT can safely re-introduce these hormones into the body to restore health, vitality and function. Ultimately, BHRT is natural and identical to what is already in the body, and it has very few side effects, unlike synthetic hormones. If you are struggling with perimenopause symptoms and would like to learn more about the benefits of bioidentical hormone replacement therapy (BHRT), contact KC Wellness at 816-214-5276 or visit http://bit.ly/2mjwoOh for more information. Posted in Uncategorized and tagged aging, BHRT, hormones, menopause, perimenopause, symptoms, women’s health.